Signage is everywhere in Monterey County. The large number of businesses that compete for business, particularly eateries, demand that your restaurant sign stands out dramatically. The millions of tourists that grace our streets yearly are all potential patrons who can boost your business exponentially. The key to uniqueness is design: the language of art. The designers at Signs by Van have produced custom business signs for the most successful restaurants in Monterey County. Our signs reinforce your brand by making it different from any other. We use nothing but top-quality materials and a unique approach to design and artistry that will impress all your visitors. Just imagine not having the one-of-a-kind design services that only Signs by Van can offer. Your business will fall prey to the competition. This market cis not the place to fall under the radar. Monterey County is about stepping up your game and making your brand a preferred visiting spot. Why not also make it a household name? 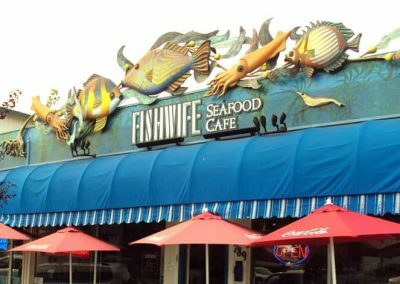 Restaurant signage is one of the most important tools of advertisement in today’s extremely competitive foodie market. A restaurant in Monterey County is competing against tons of cheaper, quicker, as well as more expensive and classy contenders who wish to provide in their own right a unique experience for their customers. Every custom business sign from Signs by Van is created in-house by our talented and experienced craftsmen who artfully combine traditional crafts and state-of-the art technology to create unique and lasting signs. We use top-of-the-line finishes so that your sign will look amazing not just at the moment of installation, but for years and decades to come. Signs by Van will help your business outshine any competition. We will ensure your success.